Google have come out and given some very clear guidelines regarding images near adsense ads, And guess what, They don't allow them, At all. We ask that publishers not line up images and ads in a way that suggests a relationship between the images and the ads. If your visitors believe that the images and the ads are directly associated, or that the advertiser is offering the exact item found in the neighboring image, they may click the ad expecting to find something that isn't actually being offered. That's not a good experience for users or advertisers. 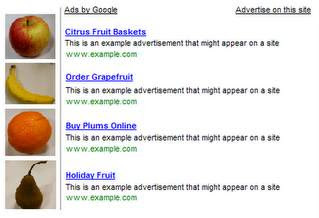 For a while people were under the impression that as long as there was a divider or space between the images and the adsense ads that it was allowed, But google have clarified their position by giving examples of what isn't allowed on their recent blog post. Google say that even though images are allowed on the page they ask Adsense publishers not to align the images with the adverts as to suggest a relationship between the images and the adsense block. They also ask owners of game sites and directories not to format their adverts in a way which "mimics" their sites content as to reduce the chance of a user clicking the advert thinking it leads to site content. The Google Adsense team were even nice enough to provide examples of adsense implementations which are not allowed, Which is probably something they should have done a long time ago.